Ghulam Muhammad was his real name. But the whole world knows him as Gama Pehalwan. The great Gama was born on 22nd May 1878 in Amritsar, Punjab, British India. He never lost any match and was undefeated in a career spanning more than 50 years. He was one of the greatest wrestlers of all time in the world. The great Gama was about 5ft, 7 inches tall and his weight was about 200 pounds (almost 90 Kg). He hailed from a prominent wrestling family which was known to produce world-class wrestlers. His father was Muhammad Aziz Baksh who was also a wrestler. His younger brother was Imam Baksh. Imam Baksh was also a great wrestler at his time. They were patronized by the Maharaja of Datia- a princely state in Madhya Pradesh. Gama had two wives: one in Pakistan and the other in Baroda, Gujarat, India. He was also the grandfather of Pakistani First Lady Kulsoom Nawaz. Gama's daily training consisted of wresting with forty of his fellow wrestlers in the court. He used to do more than thousand Baithaks (Hindu squats) and more than thousand Dands (Hindu pushups). He used a doughnut-shaped exercise disc weighing 95 kg for his squats. Today this disc is kept in the National Institute of Sports Museum of Patiala. His daily diet was more than 7.5 liters of milk, almost six desi chickens, up to half a liter of ghee with other normal food. Gama was first noticed at the age of ten when he entered a strongman competition held in Jodhpur. More than four hundred wrestlers were there in that competition and young Gama was among the last fifteen. Maharajah of Jodhpur announced Gama as the winner due to his remarkable show of enormous stamina and dedication. Fame came to Gama at the age of 17 when he challenged then-Indian Wrestling Champion, middle-aged Raheem Bakhsh Sultani Wala, a wrestler from Gujranwala, now in Punjab, Pakistan. Raheem Bakhsh Sultani Wala was at about 7 feet tall, with a very impressive win-loss record. The competition continued for hours and eventually ended in a draw. 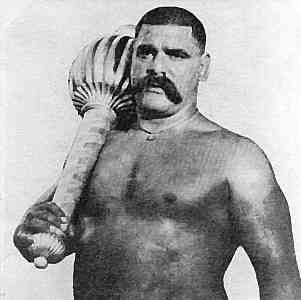 By 1910, Gama had defeated all the prominent Indian wrestlers who faced him except the champion, Raheem Bakhsh Sultani Wala. At this time, accompanied by his younger brother Imam Bakhsh, Gama went to England to compete with the Western Wrestlers, but could not gain instant entry, because of his lower height. He challenged the western wrestlers, either he would beat them or pay them the prize money and would go home. During this tour Gama defeated some of the most respected wrestler in the world. His name spread all over the world. At one point, Gama offered to fight with twenty English wrestlers, one after another. He announced that he would defeat all of them or pay out prize money, but no one would take up his challenge. After he returned from England, Gama faced Raheem Bakhsh Sultani Wala in Allahabad. The two pillars of Indian wrestling of that time were face to face. This competition eventually ended with a long struggle, and Gama won the match. He won the title of Rustam-e-Hind or Champion of India. In his later life Gama recalled Raheem Bakhsh Sultani Wala as his strongest opponent in his life. Gama did not have any opponents until 1927, when it was announced that Gama and Zbyszko would face each other again. The day finally came in 1928 when both wrestlers met again in Patiala. The result of the competition was so quick that Gama threw Zbyszko in only 42 seconds. In 1922, during a visit to India, the Prince of Wales presented Gama with a silver mace, which was symbolic of the one that is carried by the Hindu Hanuman, who represents strength. In 1902 he went to Baroda to attend a wrestling tournament. But there was no wrestler who could fight him. So Gama lifted a 2.5ft height and 1200Kg weight stone that was lying near Nazarbaug Palace, Mandvi up to his chest and carried it for some distance to show his strength. The stone is now kept at Baroda Museum in Sayajibaug and has a text inscribed on it. The text says that the stone was lifted by Gulaam Mohammed on December 23, 1902. The museum authorities find it difficult to even move the stone with the help of 25 people. It shows how much physical strength Gama possessed. He played his last match in 1929 against Swedish wrestler Jesse Peterson, and after winning this he silently retired from sport, undefeated throughout his 50-year career. The great legend Bruce Lee was a big fan of Gama. Lee read articles about Gama and how he employed his exercises to build his legendary strength for wrestling. Lee quickly incorporated them into his own routine. John Abraham is making a film on greatest wrestler Gama Pehalwan under his production house JA Entertainment. Lot of video game's characters are inspired by the Great Gama, Such as Street Fighter EX and Shadow Hearts. After the independence and partitioning of India in 1947, Gama moved to Pakistan. There he trained his nephew Bholu Pahalwan, who held the Pakistani wrestling championship for almost 20 years. The Great Gama died in Lahore, Pakistan on 23 May 1960 after a long period of illness. He suffered heart ailment and asthma and faced financial difficulties. He struggled to pay for treatment for his heart and asthma. An industrialist and wrestling fan, G. D. Birla donated ₹2,000 and a monthly pension of ₹300 to him. Later the Government of Pakistan also increased the pension to Gama and supported his medical expenses until his death. On 23rd of May 1960 the world lost her great son.